Over the course of his 20-year career, few people have delivered as much consistently mopey indie folk as Toronto's own Hayden. Now he's back with a new album, Us Alone, that sees him venture a little further afield. The record kicks off with the expected melodic melancholy of "Motel". "Oh Memory" takes a typically morose Hayden tune and uses an organ to turn it into a swirling funeral procession. A piano and strings bring a level of elegance to "Old Dreams". It's not the orchestrals that makes this record successful however, it's the surprising grit. "Just Give Me a Name" is a methodically building roots-influenced number, featuring a slight twang. "Almost Everything" is bursting with harmonica and lilt. We even get a full-on pop rock number with "Rainy Saturday 1". The standout track is undoubtedly "Blurry Nights". The song is more well-rounded than most of Hayden's oeuvre, highlighted by the duet vocals of the always delightful Lou Canon. 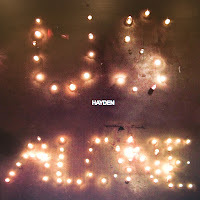 In the end Us Alone is a wonderfully varied and engaging Hayden record. It shows that even though you think you know an artist, after two decades some of them can still pleasantly surprise you. Hayden plays the Rivoli in Toronto tonight with Lou Canon. Best tracks: "Blurry Nights", "Almost Everything"